There are a lot of islands in Japan. Do you know the islands where we can interact with animals among them? Today, we’d like to introduce you about such hot places. Ookuno island is one of the islands inside the Seto Inland Sea, located in Hiroshima. This place is where has the history that ever had manufactured chemical weapons once upon a time and was eraced from Japanese map. Now, it has become the island full of rabbits ! It is said that there are about 700 rabbits inside the Ookuno island, where is also known as “the rabbit island”. 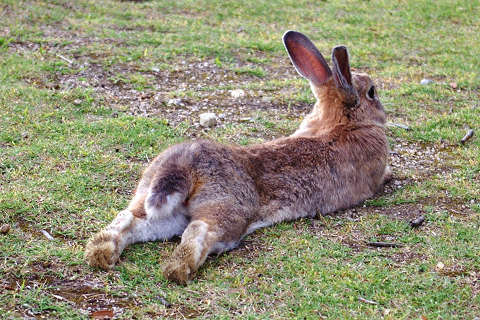 After the eight rabbits that had been bred out of the island were released, it is said to have increased so much. The rabbits here are wild though, they are tame with people. As soon as they see us, they come closer to us. I’m sure that you will be healed to interact with them. Sanagishima island is a small, idyllic place floating in the vicinity of the center of the Seto Inland Sea. The population in the island is only about 150. The islanders get along with each other, and as if they were the real family. There are so many cats all over the Sanagishima island, and islanders take care of these cats. So ,this island is known as “cat island”. The number of the ferry connecting to the Sanagi island in a day is four. If you want to spend time slowly, we recommend you to take the morning ferry. There are no hotels, homestay system, and restaurants, so if you miss the last ferry, you’ll have to camp out. The next cat island is Tashiro island located in Ishinomaki, Miyagi. It was the introduction on TV that this island has become a tourist resort. Though the island was devastated by the Great East Japan Earthquake, “Tashirojima cat-the-project” was carried out as the reconstruction project and it was achieved the target amount of money only in three months thanks to the cat’s power. The population of the islander is about 60 due to the aging. It is surprising that the number of the cats is much higher than that of the islanders. The cats living freely in the island is so cute, and they heal us very much. Mikurajima island is located in Izu islands, Tokyo. It is 200km away from Tokyo. This island is famous for dolphin watching and is known as the habitat of the world’s leading wild dolphin. It is just like a dream to be able to swim with dolphins in the sea. In Mikurajima island, we can come across the wild dolphins with a high probability, so many tourists are attracted by them. We can enjoy dolphin swimming with the island fisherman’s boat from the end of April to the middle of November. It is the Indo-Pacific bottlenose dolphin that we can swim with. The Indo-Pacific bottlenose dolphins are so friendly that they play with us for more than 30minutes. Other than dolphin swimming, you can do dolphin watching. The last place where we introduce is the World Heritage, Miyajima. Miyajima is located in Hiroshima, in the west of the Seto Inland Sea. It is a scenic spot known as one of the most beautiful scenic spots in Japan. Besides that, it is not too much to say that Miyajima is one of the leading power spots in Japan. Now, 500 Japanese deer live in Miyajima, and it is said that about 200 deer among them inhabit there. They are so meek and cute ! We can interact with them freely. Miyajima has been believed by the people as “the island of God”. They are said to be “the Messenger of God”, so we should treasure them. In each island, people and animals keep a good relationship with each other and live together. We recommend you to visit these animal islands and have a relaxing time.